Experimental evolution is the use of laboratory experiments or controlled field manipulations to explore evolutionary dynamics. Evolution may be observed in the laboratory as individuals/populations adapt to new environmental conditions by natural selection. There are two different ways in which adaptation can arise in experimental evolution. One is via an individual organism gaining a novel beneficial mutation. The other is from allele frequency change in standing genetic variation already present in a population of organisms. Other evolutionary forces outside of mutation and natural selection can also play a role or be incorporated into experimental evolution studies, such as genetic drift and gene flow. The organism used is decided by the experimenter, based on whether the hypothesis to be tested involves adaptation through mutation or allele frequency change. A large number of generations are required for adaptive mutation to occur, and experimental evolution via mutation is carried out in viruses or unicellular organisms with rapid generation times, such as bacteria and asexual clonal yeast. Polymorphic populations of asexual or sexual yeast, and multicellular eukaryotes like Drosophila, can adapt to new environments through allele frequency change in standing genetic variation. Organisms with longer generations times, although costly, can be used in experimental evolution. Laboratory studies with foxes and with rodents (see below) have shown that notable adaptations can occur within as few as 10–20 generations and experiments with wild guppies have observed adaptations within comparable numbers of generations. More recently, experimentally evolved individuals or populations are often analyzed using whole genome sequencing, an approach known as Evolve and Resequence (E&R). E&R can identify mutations that lead to adaptation in clonal individuals or identify alleles that changed in frequency in polymorphic populations, by comparing the sequences of individuals/populations before and after adaptation. The sequence data makes it possible to pinpoint the site in a DNA sequence that a mutation/allele frequency change occurred to bring about adaptation. The nature of the adaptation and functional follow up studies can shed insight into what effect the mutation/allele has on phenotype. This Chihuahua mix and Great Dane show the wide range of dog breed sizes created using artificial selection. Unwittingly, humans have carried out evolution experiments for as long as they have been domesticating plants and animals. Selective breeding of plants and animals has led to varieties that differ dramatically from their original wild-type ancestors. Examples are the cabbage varieties, maize, or the large number of different dog breeds. The power of human breeding to create varieties with extreme differences from a single species was already recognized by Charles Darwin. In fact, he started out his book The Origin of Species with a chapter on variation in domestic animals. In this chapter, Darwin discussed in particular the pigeon. Altogether at least a score of pigeons might be chosen, which if shown to an ornithologist, and he were told that they were wild birds, would certainly, I think, be ranked by him as well-defined species. Moreover, I do not believe that any ornithologist would place the English carrier, the short-faced tumbler, the runt, the barb, pouter, and fantail in the same genus; more especially as in each of these breeds several truly-inherited sub-breeds, or species as he might have called them, could be shown him. (...) I am fully convinced that the common opinion of naturalists is correct, namely, that all have descended from the rock-pigeon (Columba livia), including under this term several geographical races or sub-species, which differ from each other in the most trifling respects. Drawing of the incubator used by Dallinger in his evolution experiments. One of the first to carry out a controlled evolution experiment was William Dallinger. In the late 19th century, he cultivated small unicellular organisms in a custom-built incubator over a time period of seven years (1880–1886). Dallinger slowly increased the temperature of the incubator from an initial 60 °F up to 158 °F. The early cultures had shown clear signs of distress at a temperature of 73 °F, and were certainly not capable of surviving at 158 °F. The organisms Dallinger had in his incubator at the end of the experiment, on the other hand, were perfectly fine at 158 °F. However, these organisms would no longer grow at the initial 60 °F. Dallinger concluded that he had found evidence for Darwinian adaptation in his incubator, and that the organisms had adapted to live in a high-temperature environment. Dallinger's incubator was accidentally destroyed in 1886, and Dallinger could not continue this line of research. From the 1880s to 1980, experimental evolution was intermittently practiced by a variety of evolutionary biologists, including the highly influential Theodosius Dobzhansky. Like other experimental research in evolutionary biology during this period, much of this work lacked extensive replication and was carried out only for relatively short periods of evolutionary time. Experimental evolution has been used in various formats to understand underlying evolutionary processes in a controlled system. Experimental evolution has been performed on multicellular and unicellular eukaryotes, prokaryotes, and viruses. Similar works have also been performed by directed evolution of individual enzyme, ribozyme and replicator genes. In the 1950s, the Soviet biologist Georgy Shaposhnikov conducted experiments on aphids of the Dysaphis genus. By transferring them to plants normally nearly or completely unsuitable for them, he had forced populations of parthenogenetic descendants to adapt to the new food source to the point of reproductive isolation from the regular populations of the same species. One of the first of a new wave of experiments using this strategy was the laboratory "evolutionary radiation" of Drosophila melanogaster populations that Michael R. Rose started in February, 1980. This system started with ten populations, five cultured at later ages, and five cultured at early ages. Since then more than 200 different populations have been created in this laboratory radiation, with selection targeting multiple characters. Some of these highly differentiated populations have also been selected "backward" or "in reverse," by returning experimental populations to their ancestral culture regime. Hundreds of people have worked with these populations over the better part of three decades. Much of this work is summarized in the papers collected in the book Methuselah Flies. The early experiments in flies were limited to studying phenotypes but the molecular mechanisms, i.e., changes in DNA that facilitated such changes, could not be identified. This changed with genomics technology. Subsequently, Thomas Turner coined the term Evolve and Resequence (E&R) and several studies used E&R approach with mixed success. One of the more interesting experimental evolution studies was conducted by Gabriel Haddad's group at UC San Diego, where Haddad and colleagues evolved flies to adapt to low oxygen environments, also known as hypoxia. After 200 generations, they used E&R approach to identify genomic regions that were selected by natural selection in the hypoxia adapted flies. More recent experiments are following up E&R predictions with RNAseq and genetic crosses. Such efforts in combining E&R with experimental validations should be powerful in identifying genes that regulate adaptation in flies. Bacteria have short generation times, easily sequenced genomes, and well-understood biology. They are therefore commonly used for experimental evolution studies. One of the most widely known examples of laboratory bacterial evolution is the long-term E.coli experiment of Richard Lenski. On February 24, 1988, Lenski started growing twelve lineages of E. coli under identical growth conditions. When one of the populations evolved the ability to aerobically metabolize citrate from the growth medium and showed greatly increased growth, this provided a dramatic observation of evolution in action. The experiment continues to this day, and is now the longest-running (in terms of generations) controlled evolution experiment ever undertaken. Since the inception of the experiment, the bacteria have grown for more than 60,000 generations. Lenski and colleagues regularly publish updates on the status of the experiments. Mouse from the Garland selection experiment with attached running wheel and its rotation counter. In 1998, Theodore Garland, Jr. and colleagues started a long-term experiment that involves selective breeding of mice for high voluntary activity levels on running wheels. This experiment also continues to this day (> 65 generations). Mice from the four replicate "High Runner" lines evolved to run almost three times as many running-wheel revolutions per day compared with the four unselected control lines of mice, mainly by running faster than the control mice rather than running for more minutes/day. 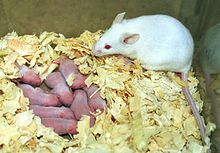 Female mouse with her litter, from the Garland selection experiment. 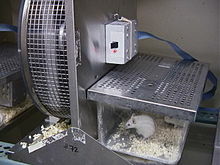 The HR mice exhibit an elevated maximal aerobic capacity when tested on a motorized treadmill. They also exhibit alterations in motivation and the reward system of the brain. Pharmacological studies point to alterations in dopamine function and the endocannabinoid system. The High Runner lines have been proposed as a model to study human attention-deficit hyperactivity disorder (ADHD), and administration of Ritalin reduces their wheel running approximately to the levels of control mice. Click here for a mouse wheel running video. Stickleback fish have both marine and freshwater species, the freshwater species evolving since the last ice age. Freshwater species can survive colder temperatures. Scientists tested to see if they could reproduce this evolution of cold-tolerance by keeping marine sticklebacks in cold freshwater. It took the marine sticklebacks only three generations to evolve to match the 2.5 degree Celsius improvement in cold-tolerance found in wild freshwater sticklebacks. Microbial cells  and recently mammalian cells  are evolved under nutrient limiting conditions to study their metabolic response and engineer cells for better characteristics. Because of their rapid generation times microbes offer an opportunity to study microevolution in the classroom. A number of exercises involving bacteria and yeast teach concepts ranging from the evolution of resistance to the evolution of multicellularity. With the advent of next-generation sequencing technology it has become possible for students to conduct an evolutionary experiment, sequence the evolved genomes, and to analyze and interpret the results. ^ a b "Experimental Evolution". Nature. ^ a b c d e Long, A; Liti, G; Luptak, A; Tenaillon, O (2015). "Elucidating the molecular architecture of adaptation via evolve and resequence experiments". Nature Reviews Genetics. 16 (10): 567–582. doi:10.1038/nrg3937. ISSN 1471-0056. PMC 4733663. PMID 26347030. ^ a b Kawecki, T.J.; Lenski, R.E. ; Ebert, D.; Hollis, B.; Olivieri, I.; Whitlock, M.C. (2012). "Experimental evolution". Trends in Ecology & Evolution. 27 (10): 547–560. doi:10.1016/j.tree.2012.06.001. PMID 22819306. ^ Buckling A, Craig Maclean R, Brockhurst MA, Colegrave N (February 2009). "The Beagle in a bottle". Nature. 457 (7231): 824–9. doi:10.1038/nature07892. PMID 19212400. ^ Elena SF, Lenski RE (June 2003). "Evolution experiments with microorganisms: the dynamics and genetic bases of adaptation". Nat. Rev. Genet. 4 (6): 457–69. doi:10.1038/nrg1088. PMID 12776215. ^ Reznick, D. N.; F. H. Shaw; F. H. Rodd; R. G. Shaw (1997). "Evaluation of the rate of evolution in natural populations of guppies (Poecilia reticulata)". Science. 275 (5308): 1934–1937. doi:10.1126/science.275.5308.1934. PMID 9072971. ^ Barrick, Jeffrey E.; Lenski, Richard E. (2013). "Genome dynamics during experimental evolution". Nature Reviews Genetics. 14 (12): 827–839. doi:10.1038/nrg3564. PMC 4239992. PMID 24166031. ^ a b c Jha AR, Miles CM, Lippert NR, Brown CD, White KP, Kreitman M (June 2015). "Whole-Genome Resequencing of Experimental Populations Reveals Polygenic Basis of Egg-Size Variation in Drosophila melanogaster". Mol. Biol. Evol. 32 (10): 2616–32. doi:10.1093/molbev/msv136. PMC 4576704. PMID 26044351. ^ a b c Turner TL, Stewart AD, et al. (March 2011). "Population-Based Resequencing of Experimentally Evolved Populations Reveals the Genetic Basis of Body Size Variation in Drosophila melanogaster". PLoS Genet. 7 (3): e1001336. doi:10.1371/journal.pgen.1001336. PMC 3060078. PMID 21437274. ^ Hass, J. W. (2000-01-22). "The Reverend Dr William Henry Dallinger, F.R.S. (1839–1909)". Notes and Records. 54 (1): 53–65. doi:10.1098/rsnr.2000.0096. ISSN 0035-9149. PMID 11624308. ^ Zimmer, Carl (2011). Losos, Johnathon (ed.). Darwin Under the Microscope: Witnessing Evolution in Microbes (PDF). In the Light of Evolution: Essays from the Laboratory and Field. W. H. Freeman. pp. 42–43. ISBN 978-0981519494. ^ Dobzhansky, T; Pavlovsky, O (1957). "An experimental study of interaction between genetic drift and natural selection". Evolution. 11 (3): 311–319. doi:10.2307/2405795. JSTOR 2405795. ^ Marden, JH; Wolf, MR; Weber, KE (November 1997). "Aerial performance of Drosophila melanogaster from populations selected for upwind flight ability". The Journal of Experimental Biology. 200 (Pt 21): 2747–55. PMID 9418031. ^ Ratcliff, WC; Denison, RF; Borrello, M; Travisano, M (31 January 2012). "Experimental evolution of multicellularity". Proceedings of the National Academy of Sciences of the United States of America. 109 (5): 1595–600. doi:10.1073/pnas.1115323109. PMC 3277146. PMID 22307617. ^ Barrick, JE; Yu, DS; Yoon, SH; Jeong, H; Oh, TK; Schneider, D; Lenski, RE; Kim, JF (29 October 2009). "Genome evolution and adaptation in a long-term experiment with Escherichia coli". Nature. 461 (7268): 1243–7. doi:10.1038/nature08480. PMID 19838166. ^ Heineman, RH; Molineux, IJ; Bull, JJ (August 2005). "Evolutionary robustness of an optimal phenotype: re-evolution of lysis in a bacteriophage deleted for its lysin gene". Journal of Molecular Evolution. 61 (2): 181–91. doi:10.1007/s00239-004-0304-4. PMID 16096681. ^ Bloom, JD; Arnold, FH (16 June 2009). "In the light of directed evolution: pathways of adaptive protein evolution". Proceedings of the National Academy of Sciences of the United States of America. 106 Suppl 1: 9995–10000. doi:10.1073/pnas.0901522106. PMC 2702793. PMID 19528653. ^ Moses, AM; Davidson, AR (17 May 2011). "In vitro evolution goes deep". Proceedings of the National Academy of Sciences of the United States of America. 108 (20): 8071–2. doi:10.1073/pnas.1104843108. PMC 3100951. PMID 21551096. ^ Salehi-Ashtiani, K; Szostak, JW (1 November 2001). "In vitro evolution suggests multiple origins for the hammerhead ribozyme". Nature. 414 (6859): 82–4. doi:10.1038/35102081. PMID 11689947. ^ Sumper, M; Luce, R (January 1975). "Evidence for de novo production of self-replicating and environmentally adapted RNA structures by bacteriophage Qbeta replicase". Proceedings of the National Academy of Sciences of the United States of America. 72 (1): 162–6. doi:10.1073/pnas.72.1.162. PMC 432262. PMID 1054493. ^ Mills, DR; Peterson, RL; Spiegelman, S (July 1967). "An extracellular Darwinian experiment with a self-duplicating nucleic acid molecule". Proceedings of the National Academy of Sciences of the United States of America. 58 (1): 217–24. doi:10.1073/pnas.58.1.217. PMC 335620. PMID 5231602. ^ Rose, M. R. (1984). "Artificial selection on a fitness component in Drosophila melanogaster". Evolution. 38 (3): 516–526. doi:10.2307/2408701. JSTOR 2408701. PMID 28555975. ^ Rose, Michael R; Passananti, Hardip B; Matos, Margarida (2004). Methuselah Flies. Singapore: World Scientific. doi:10.1142/5457. ISBN 978-981-238-741-7. ^ Burke MK, Dunham JP, et al. (Sep 2015). "Genome-wide analysis of a long-term evolution experiment with Drosophila". Nature. 467 (7315): 587–90. doi:10.1038/nature09352. PMID 20844486. ^ Schlötterer C, Tobler R, Kofler R, Nolte V (Nov 2014). "Sequencing pools of individuals - mining genome-wide polymorphism data without big funding". Nat. Rev. Genet. 15 (11): 749–63. doi:10.1038/nrg3803. PMID 25246196. ^ Schlötterer C, Kofler R, Versace E, Tobler R, Franssen SU (Oct 2014). "Combining experimental evolution with next-generation sequencing: a powerful tool to study adaptation from standing genetic variation". Heredity. 114 (5): 431–40. doi:10.1038/hdy.2014.86. PMC 4815507. PMID 25269380. ^ Zhou D, Xue J, Chen J, Morcillo P, Lambert JD, White KP, Haddad GG (May 2007). "Experimental selection for Drosophila survival in extremely low O(2) environment". PLOS ONE. 2 (5): e490. doi:10.1371/journal.pone.0000490. PMC 1871610. PMID 17534440. ^ Zhou D, Udpa N, Gersten M, Visk DW, Bashir A, Xue J, Frazer KA, Posakony JW, Subramaniam S, Bafna V, Haddad GG (Feb 2011). "Experimental selection of hypoxia-tolerant Drosophila melanogaster". Proc. Natl. Acad. Sci. USA. 108 (6): 2349–54. doi:10.1073/pnas.1010643108. PMC 3038716. PMID 21262834. ^ Remolina SC, Chang PL, Leips J, Nuzhdin SV, Hughes KA (Nov 2012). "Genomic basis of aging and life-history evolution in Drosophila melanogaster". Evolution. 66 (11): 3390–403. doi:10.1111/j.1558-5646.2012.01710.x. PMC 4539122. PMID 23106705. ^ Lenski, Richard E.; Rose, Michael R.; Simpson, Suzanne C.; Tadler, Scott C. (1991-12-01). "Long-Term Experimental Evolution in Escherichia coli. I. Adaptation and Divergence During 2,000 Generations". The American Naturalist. 138 (6): 1315–1341. doi:10.1086/285289. ISSN 0003-0147. ^ Fox, Jeremy W.; Lenski, Richard E. (2015-06-23). "From Here to Eternity—The Theory and Practice of a Really Long Experiment". PLOS Biology. 13 (6): e1002185. doi:10.1371/journal.pbio.1002185. ISSN 1545-7885. PMC 4477892. PMID 26102073. ^ Blount, Zachary D.; Borland, Christina Z.; Lenski, Richard E. (2008-06-10). "Historical contingency and the evolution of a key innovation in an experimental population of Escherichia coli". Proceedings of the National Academy of Sciences. 105 (23): 7899–7906. doi:10.1073/pnas.0803151105. ISSN 0027-8424. PMC 2430337. PMID 18524956. ^ Keeney BK, Raichlen DA, Meek TH, Wijeratne RS, Middleton KM, Gerdeman GL, Garland T (2008). "Differential response to a selective cannabinoid receptor antagonist (SR141716: rimonabant) in female mice from lines selectively bred for high voluntary wheel-running behavior" (PDF). Behavioural Pharmacology. 19 (8): 812–820. doi:10.1097/FBP.0b013e32831c3b6b. PMID 19020416. ^ Barrett, R. D. H.; Paccard, A.; Healy, T. M.; Bergek, S.; Schulte, P. M.; Schluter, D.; Rogers, S. M. (2010). "Rapid evolution of cold tolerance in stickleback". Proceedings of the Royal Society B: Biological Sciences. 278 (1703): 233–238. doi:10.1098/rspb.2010.0923. PMC 3013383. PMID 20685715. ^ Dragosits, Martin; Mattanovich, Diethard (2013). "Adaptive laboratory evolution – principles and applications for biotechnology". Microbial Cell Factories. 12 (1): 64. doi:10.1186/1475-2859-12-64. ISSN 1475-2859. PMC 3716822. PMID 23815749. ^ Maralingannavar, Vishwanathgouda; Parmar, Dharmeshkumar; Pant, Tejal; Gadgil, Chetan; Panchagnula, Venkateswarlu; Gadgil, Mugdha (2017). "CHO cells adapted to inorganic phosphate limitation show higher growth and higher pyruvate carboxylase flux in phosphate replete conditions". Biotechnology Progress. 33 (3): 749–758. doi:10.1002/btpr.2450. ISSN 8756-7938. PMID 28220676. ^ Hyman, Paul (2014). "Bacteriophage as instructional organisms in introductory biology labs". Bacteriophage. 4 (2): e27336. doi:10.4161/bact.27336. ISSN 2159-7081. PMC 3895413. PMID 24478938. ^ "A Novel Laboratory Activity for Teaching about the Evolution of Multicellularity". The American Biology Teacher. 76 (2): 81–87. 2014. doi:10.1525/abt.2014.76.2.3. ISSN 0002-7685. ^ Mikheyev, Alexander S.; Arora, Jigyasa (2015). "Using experimental evolution and next-generation sequencing to teach bench and bioinformatic skills". PeerJ PrePrints (3): e1674. doi:10.7287/peerj.preprints.1356v1. Bennett, A. F. (2003). "Experimental evolution and the Krogh Principle: generating biological novelty for functional and genetic analyses" (PDF). Physiological and Biochemical Zoology. 76 (1): 1–11. doi:10.1086/374275. PMID 12695982. Dallinger, W. H. 1887. The president's address. J. Roy. Microscop. Soc., 185-199. Elena, S. F.; Lenski, R. E. (2003). "Evolution experiments with microorganisms: the dynamics and genetic bases of adaptation". Nature Reviews Genetics. 4 (6): 457–469. doi:10.1038/nrg1088. PMID 12776215. Gibbs, A. G. (1999). "Laboratory selection for the comparative physiologist". Journal of Experimental Biology. 202: 2709–2718. Lenski, R. E. (2004). Phenotypic and genomic evolution during a 20,000-generation experiment with the bacterium Escherichia coli. Plant Breeding Reviews. 24. pp. 225–265. doi:10.1002/9780470650288.ch8. ISBN 9780470650288. Lenski, R. E.; Rose, M. R.; Simpson, S. C.; Tadler, S. C. (1991). "Long-term experimental evolution in Escherichia coli. I. Adaptation and divergence during 2,000 generations". American Naturalist. 138 (6): 1315–1341. doi:10.1086/285289. McKenzie, J. A.; Batterham, P. (1994). "The genetic, molecular and phenotypic consequences of selection for insecticide resistance". Trends in Ecology and Evolution. 9 (5): 166–169. doi:10.1016/0169-5347(94)90079-5. PMID 21236810. Reznick, D. N.; Bryant, M. J.; Roff, D.; Ghalambor, C. K.; Ghalambor, D. E. (2004). "Effect of extrinsic mortality on the evolution of senescence in guppies". Nature. 431 (7012): 1095–1099. doi:10.1038/nature02936. PMID 15510147. Rose, M. R., H. B. Passananti, and M. Matos, eds. 2004. Methuselah flies: A case study in the evolution of aging. World Scientific Publishing, Singapore. Swallow, J. G.; Jr; Garland, T. (2005). "Selection experiments as a tool in evolutionary and comparative physiology: insights into complex traits — An introduction to the symposium" (PDF). Integrative and Comparative Biology. 45 (3): 387–390. doi:10.1093/icb/45.3.387. PMID 21676784. A movie illustrating the dramatic differences in wheel-running behavior. Experimental Evolution Publications by Ted Garland: Artificial Selection for High Voluntary Wheel-Running Behavior in House Mice — a detailed list of publications. Experimental Evolution — a list of laboratories that study experimental evolution. Network for Experimental Research on Evolution, University of California. Inquiry-based middle school lesson plan: "Born to Run: Artificial Selection Lab"